Chef and restaurateur Jacques Reymond came to Australia 20 years ago expecting to stay for a short time and is now a Melbourne institution. He has a restaurant in Prahran and the Arintji café and bar at Federation Square. He appears regularly on Bert Newton’s Good Morning Australia show and last year filmed a 13-part television series for the ABC. Wegner was born in New Zealand and came to Australia as a child. He has studied fine arts and education, and between 1996 and 2002 was a visiting lecturer at Ballarat and La Trobe universities and RMIT. He has had seven solo exhibitions since 1982 and has exhibited in numerous group shows. He was a finalist in the Doug Moran National Portrait Prize in 1998 and 2002 and the Fleurieu Landscape Prize in 1998. In 2001 he was selected in the James Farrell Invitation Self Portrait Prize, the Mornington Drawing Prize, and the Flemington Muntz Albury Art Prize. 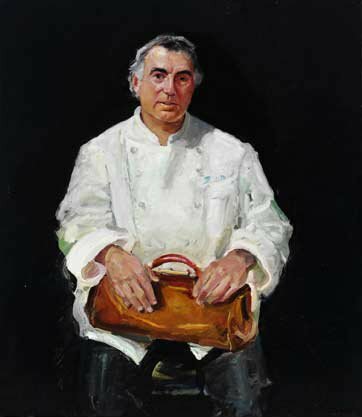 Wegner was an Archibald finalist in 2000 and in the same year was selected for the Sporting Prize also at the Art Gallery of New South Wales.